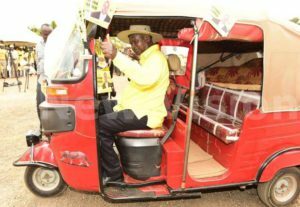 President Museveni enjoys a ride in a Tuk Tuk motorcycle before addressing Sitenda Sebalu’s supporters. Courtesy photo. 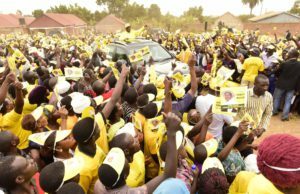 President Yoweri Museveni has urged voters of Kyaddondo East to cast their votes for the National Resistance Movement flag-bearer Sitenda Sebalu. The President while addressing a rally at Kasangati Resort said the Kyanddondo East voters have been sending him the wrong people something that has always hindered service delivery in the area. “The leaders you send do not help you. 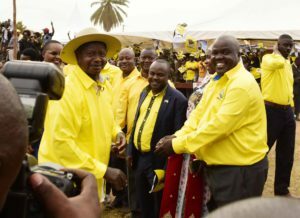 You have been voting Sebana Kizito Nasser Ssebagala Erias Lukwago and Kantinti,” the President said, adding that such leaders are far away from his mind. The President was responding to a series of demands from boda boda cyclists, taxi drivers and conductors. He blamed them for using longer routes to reach him when they can shorten the route by voting for Sitenda Sebalu instead of Apollo Kantinti who he said is just blocking the route. “Using the Inspector General of Government to reach me is a much longer route. Just vote for Sebalu and if he does not see me, he will see the Prime Minister or the Secretary General,” the President said. He also promised to look into the issue of Tuku Tukus, a form of boda boda transport, recently abolished by the Minister in charge of Kampala, Ms Beti Olive Kamya. President Museveni arrives at the rally venue. Meanwhile, Robert Kyagulanyi, who was briefly detained at Kira Road Police Station following his arrest in the morning held a long procession to Gayaza. By press time, he was set to address a mammoth crowd gathered to listen to the singer-turned politician. Several local artistes joined to drum up support for their fellow singer. The Forum for Democratic Change (FDC) party candidate, Apollo Kantinti, addressed his final rally at Wampewo Grounds. He was flanked by the party’s big wigs, including four-time presidential candidate Dr Kizza Besigye and the party’s president Rtd Gen Mugisha Muntu. Dr Besigye urged Kyandondo East voters to vote for Kantinti, arguing that the circumstances that led to the cancellation of his 2016 victory were not of his own making.